Remember when we thought Andi's sister actually being her mom was biggest plot twist of Andi Mack? Boy, did they prove us wrong. Now that the show is on its second season – and officially getting a third, yay! – we know that drama and shock factor is a staple of the Disney Channel series. And naturally, Bex is responsible for a lot of it. Her relationship with Bowie, for one, is super complex and always keeping us on our toes. Everyone who is a fan of the show is just dying to see if Bex and Bowie end up together, making Andi's dream of having her family together a reality. But perhaps they will each go down different paths and end up falling in love with someone new. Only time will tell, but it's safe to say Lilan Bowden herself thinks Bex and Bowie are endgame. J-14 caught up with Lilan, and she dished her opinion on her on-screen relationship. Watch the video above to see our exclusive interview with Andi Mack's Lilan Bowden (AKA Bex). 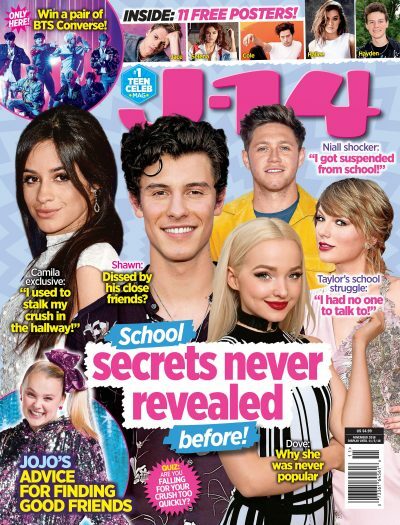 Lilan exclusively spilled to J-14, "Oh my gosh – I'm rooting for Bex and Bowie I think just as much as everybody is – because I don't know what's going to happen either. But I mean, also because my co-star Trent [Garrett] is just so fun to be around. It's like – we gotta see more Bex and Bowie." It's true – it would be a shame not to see more Bex and Bowie in the upcoming episodes. There's no denying that spark between them, if you ask us. Trent isn't the only co-star Lilan has a blast with on and off-screen. Lilan continued to explain to us the kinds of things she and the rest of the cast do together. She told us, "These kids – they're so mature and so smart that I feel like I'm the one learning from them a lot. But what's great is that we can share our experiences with each other. I know what it's like to be an actor that got started later – they know what it's like to be an actor that got started earlier. So when we share experiences together, we both can learn form each other." So sweet – looks like the Andi Mack crew is actually like one big fam.